Anti-tank warfare arose as a result of the need to develop technology and tactics to destroy tanks during the First World War. Since the first tanks were developed by the allies in 1916 but not principally used till 1917 the first anti-tank weapon was developed by Germany. It was a scaled-up bolt-action rifle designated the Mauser Tank-Gewehr Model 1918 that fired a 13mm cartridge with a solid bullet that could penetrate the thin armor of tanks of the time and destroy the engine or ricochet inside killing occupants. Because tanks represent an enemy's greatest force projection (aside from nuclear artillery and tank vs. tank engagements), anti-tank warfare has been incorporated into the doctrine of nearly every combat service since. The predominant anti-tank weapons at the start of the Second World War were the tank-mounted gun, limbered (towed) anti-tank guns and anti-tank grenades used by the infantry as well as ground-attack aircraft such as the Junkers Ju 87 Stuka. Anti-tank warfare evolved rapidly, particularly on the Eastern Front, to include new infantry and infantry support weapons such as the bazooka, anti-tank combat engineering, specialized anti-tank aircraft and self-propelled anti-tank guns (tank destroyers). Both the Soviet Red Army and the German Army developed methods of combating tank-led offensives, including deployment of static anti-tank weapons embedded in in-depth defensive positions, protected by anti-tank obstacles and minefields, and supported by mobile anti-tank reserves and ground attack aircraft. From the Korean War to the Cold War, The United States, Soviet Union and other countries faced the possibility that a nuclear weapon could be detonated over an area of tank concentration in one strike. While technology was developed to protect crews of armored vehicles from the effects of radiation, the same could not be done for all their supporting arms and the supply train on which tanks depend for spares, fuel and maintenance. In the NATO countries little if any development took place on defining a doctrine of how to use armed forces without the use of tactical nuclear weapons. In the Soviet sphere of influence the legacy doctrine of operational maneuver was being theoretically examined to understand how a tank-led force could be used even with the threat of limited use of nuclear weapons on the European battlefield. The solution they arrived at was maneuver warfare while massively increasing the number of anti-tank weapons. To achieve this, Soviet military theorists (such as Vasily Sokolovsky) realized that anti-tank weapons had to assume an offensive role rather than the traditionally defensive role of the Great Patriotic War by becoming more mobile. This led to the development of improved guided anti-tank missiles, though similar design work was being performed in Western Europe and the United States. The French SS.10 missile was the first successfully used in anti-tank combat—by the Israel Defense Forces during the Suez Crisis of 1956, but the impact of Soviet anti-tank missile tactics was not evident until 1973, when Russian 9K11 Malyutka (Sagger) missiles were used by the Egyptian and Syrian armies during the Yom Kippur War against Israel. The outcome suggested that although the French missiles were a threat, they could be countered. The explosive power delivered by the missiles convinced NATO tank designers to continue their emphasis on increased armor, while Soviet designers retained their emphasis on mobility of tank-led forces. The utility of the light anti-tank weapon was also recognized by both sides of the Cold War and led to further development of man-portable weapons used by the infantry squad, while heavier missiles were mounted on dedicated missile tank-destroyers, including dedicated anti-tank helicopters, and even heavier guided anti-tank missiles launched from aircraft. 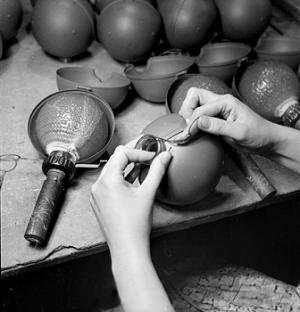 Also being developed were new varieties of artillery munitions in the form of top-attack shells, and shells that were used to saturate areas with anti-armor bomblets. Helicopters could be used as well to rapidly deliver scattered anti-tank mines. Since the end of the Cold War in 1993, the only major new threats to tanks and other armored vehicles, has been the remotely detonated improvised explosive devices (IED's) used in asymmetric warfare and weapon systems like the RPG-29 and FGM-148 Javelin, which can defeat reactive armor or shell armor. The latter weapon systems use a tandem warhead where the first stage of the tandem warhead activates the reactive armor, and the second stage of the tandem warhead defeats the shell armor by means of a High Explosive Anti Tank (HEAT) shaped charge. The use of the tank was primarily based on the assumption that once they were able to eliminate the German trench lines with their machine gun and Infantry support gun positions, the Allied infantry would follow and secure the breach, and the cavalry would exploit the breach in the trench lines by attacking into the depth of German-held territory, eventually capturing the field artillery positions and interdicting logistics and reserves being brought up from the rear areas. Naval crews initially used to operate the installed naval guns and machine guns were replaced with Army personnel who were more aware of the infantry tactics with which the tanks were intended to cooperate. However, there was no means of communication between the tank's crew and the accompanying infantry, or between the tanks participating in combat. Radios were not yet portable or robust enough to be mounted in a tank, although Morse Code transmitters were installed in some Mark IVs at Cambrai as messaging vehicles. Attaching a field telephone to the rear would become a practice only during the next war. With greater use of tanks by both sides it was realized that the accompanying infantry could be forced to ground by ambush fire, thus separating them from the tanks, which would continue to advance, eventually finding themselves exposed to close-assaults by German infantry and sappers. The early tanks were mechanically rudimentary. The 0.23-to-0.47-inch (5.8 to 11.9 mm) thick armor generally prevented penetration by small arms fire and shell fragments. However, even a near miss from field artillery or an impact from a mortar HE round easily disabled the tank, or destroyed it if the fuel tank was ruptured, incinerating the tank's crew. 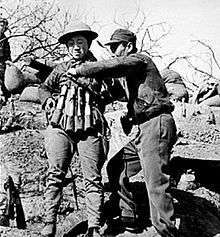 A large caliber gun was recognized as a tactical necessity to attack machine gun positions and defeat any infantry field pieces found in the trench lines which could easily disable tank track with the HE ammunition. This was achieved by mounting a QF 6 pounder Hotchkiss light 57 mm naval gun mounted in the hull barbettes. Hull and track engineering was largely dictated by the terrain—the need to cross wide trenches—although the relationship between ground pressure and soil-vehicle mechanics was not resolved until the Second World War. Turrets were later introduced on medium and light tanks to react to ambushes during the advance. With the appearance of Allied tanks the German Army were quick to introduce new anti-tank defense detachments within the pioneer battalions of the infantry divisions. These were initially issued 1.3 cm caliber long barrel rifles firing solid shot. However these suffered from fouling after 2–3 rounds and had a recoil that was unsustainable by the mechanism or the rifleman. Stick grenades were used to destroy the tracks by individual pioneers, however this required for accompanying machine-gunners to first separate the supporting Allied infantry line from the tanks, which proved difficult. Another tactic was to lure the tank beyond the German trench-line, re-establishing it just as the Allied infantry approached. The tank would then be engaged by the divisional 7.7 cm guns brought forward, that would try to disable the tracks with ordinary HE shells (and later AP ammunition). If the crews of the disabled tanks refused to surrender, they were engaged with flamethrowers, or a mortar would be fired on the stricken vehicle until a direct hit was achieved on the top surface, usually resulting in an internal fire. Finally, anti-tank obstacles were prepared on the likely approaches by deepening and widening existing ground cratering, the precursors of the anti-tank trench. Finally in early 1917 the 3.7 cm TaK from Rheinmetall was rushed to the frontline, and proved effective in destroying the tanks despite limited elevation and traverse. The Maginot line defenses - up to 25 km (16 mi) deep from the forward positions to the rear line - were intended to prevent a surprise attack and delay any attack while the French Army was mobilized. With the relative numerical inferiority between the France and Germany, it was a more effective use of manpower. Within the line passive anti-tank obstacles were supported by anti-infantry and anti-tank bunkers. After Belgium declared neutrality in 1936, France began work on extending the line along the Belgian border. Improved artillery was seen as the quickest solution to anti-tank defense, and one of the earliest post-war anti-tank gun designs was the 25 mm Hotchkiss model from France. It was intended to replace an Atelier de Puteaux 37 mm weapon designed in 1916 to destroy machine gun positions. Rheinmetall commenced design of a 37 mm anti-tank gun in 1924 and the first guns were produced in 1928 as 3.7 cm Pak L/45, later adopted in Wehrmacht service as 3.7 cm Pak 36. It made an appearance during the Spanish Civil War, as did the Bofors 37 mm developed in Sweden, and used by many early Second World War combatants. The British Army accepted for service the (40 mm) Ordnance QF 2 pounder which was developed as a tank gun. The Soviet Red Army after the Russian Civil War also begun a search for an anti-tank gun with a French Hotchkiss 37 mm L.33 tank gun, but soon upgraded this to a higher velocity L.45 Model 1935 while also making a licensed copy of the German 3.7 cm PaK 36. However, the Red Army was almost immediately taught a lesson about anti-tank warfare when a tank battalion sent to aid the Spanish Republicans in the Spanish Civil War was almost entirely destroyed in an engagement. At this time the predominant ammunition used against tanks was the armor-piercing kinetic energy shell that defeated armor by direct pressure, spiking or punching through it. During the late 1930s shaped charge ammunition was experimented with that used chemical energy for armor penetration. The shaped charge concept is officially known as the "Munroe Effect" and was discovered by accident decades earlier by Professor Charles E. Munroe at the U.S. Torpedo Station, Providence, RI. Professor Munroe was detonating different manufactured blocks of explosives on a sheet of armor plating and observed the blocks having the manufacturing letters recessed (vs. raised) cut an imprint of the manufacturing letters into the armor plate—the birth of the shaped-charged explosive which focuses the blast energy caused by an indentation on the surface area of an explosive. Although shaped charges are somewhat more difficult to manufacture, the advantage is that the projectile does not require high velocity as typical kinetic energy shells yet on impact it creates a high-velocity jet of molten metal which creates tremendously high pressures and heat, hydrodynamically penetrating the armor and killing occupants inside. The depth of the penetration, though proportional to the length of the jet and the square root of its density, is also dependent on the strength of the armor. With the development of this new ammunition begun more advanced research into steel manufacturing, and development of spaced armor that caused "jet waver" by detonating prematurely or at the wrong angle to the surface of the main armor. In Spain the anti-tank defense of the Nationalists was organized by the Wehrmacht officers, and the anti-tank guns were incorporated into a system of obstacles that were constructed with the intent to stop an attack by tanks by slowing it down, separating them from supporting infantry (advancing on foot) with machine-gun and mortar fire, and forcing tanks to conduct deliberate head-on assaults with engineer support, or seek a less-defended area to attack. Minefields laid with purpose-designed mines were used for the first time, destroying tank tracks, and forcing combat engineers to clear them on foot. Delay meant that Nationalist field artillery could engage the lightly armored Soviet tanks. This meant a change in Republican operational and eventually strategic planning, and a more protracted combat operations, with more casualties at a greater cost. Ironically, in the early 1930s until the Spanish War, German officers were conducting secret testing of a new way of employing tanks, infantry and artillery offensively in the Soviet Union with the cooperation of the Red Army. In Germany these developments eventually culminated in tactics that later came to be known as Blitzkrieg, while in the Soviet Union they formed the core of the deep battle operational doctrine. The successful test of the latter was during the Battles of Khalkhin Gol although the Red Army foundered on the Mannerheim Line in 1940, largely due to the purge in the Officer Corps, claiming many of the senior proponents of the new doctrine. Anti-tank artillery would be included in mobile tank-led Wehrmacht and Red Army units due to the possibility of encountering enemy tanks in a meeting engagement. Two aspects of how the Second World War commenced helped to delay development of anti-tank warfare: resignation and surprise. After Poland was attacked, its allies in the West were resigned to its defeat by a numerically superior Wehrmacht. The little information that was brought out about the conduct of combat during that campaign did nothing to convince either France, Britain or the USSR of the need for improved anti-tank technology and tactics. The reliance on the Maginot Line, and the subsequent surprise of the German offensive left no time to develop existing capabilities and tactics in the West. The British were preparing the stop lines and the anti-tank islands to slow enemy progress and restrict the route of an attack. The Red Army however was fortunate in having several excellent designs for anti-tank warfare that were either in final stages of development for production, or had been rejected earlier as unnecessary and could now be rushed into production. The relative ease with which the older models of Red Army's tank fleet were destroyed by German anti-tank weapons, using tactics already seen in Spain, once and for all focused Stavka attention on anti-tank warfare as Soviet armies were repeatedly encircled by panzer-led strategic pincer maneuvers. Of the three iconic Soviet weapons of the Second World War, two were made exclusively for anti-tank warfare, the T-34 and the Ilyushin Il-2 Shturmovik. The former was one of the most manufactured tanks in history, and the latter, itself dubbed the 'flying tank', was one of the most manufactured aircraft. The war also saw the creation and almost immediate abandonment of the self-propelled tank destroyer which would be replaced post war by the anti tank guided missile. The first aircraft capable of engaging tanks were the Junkers Ju-87 "Stuka" using dive bombing to place the bomb close to the target. Some French and German fighters fitted with 20 mm cannon were also able to engage thinner top armor surfaces of the tanks early in the war. The Stuka was also given cannons for anti-armor role though it was obsolete by 1942, and was joined by the Henschel Hs 129 that mounted a podded 30 mm (1.2 in) MK 101 cannon beneath its fuselage, while the Red Army Air Force fielded the Soviet Ilyushin Il-2 armed with a pair of 23 mm cannons and unguided rockets, but armored to enable the pilots to approach German tanks at very low altitude, ignoring small arms, machine-gun and even small anti-aircraft cannon fire that usually provided tanks with protection against the bombers. Il-2s could also carry large numbers of 2.5 kg shaped-charge anti-tank PTAB bombs. Field artillery were often the first ground combat arm to engage detected concentration of troops which included tanks through artillery airborne observers, either in assembly areas (for refueling and rearming), during approach marches to the combat zone, or as the tank unit was forming up for the attack. Conventional artillery shells were very effective against the tank's thinner top armor if fired in appropriate density while the tanks were concentrated, enabling direct hits by a sufficiently powerful shell. Even a non-penetrating shell could still disable a tank through dynamic shock, internal armor shattering or simply overturning the tank. More importantly the tanks could be disabled due to damage to tracks and wheels, and their supporting vehicles and personnel could be damaged and killed, reducing unit's ability to fight in the longer term. Because tanks were usually accompanied by infantry mounted on trucks or half-tracked vehicles that lacked overhead armor, field artillery that fired a mix of ground and air-burst ammunition was likely to inflict heavy casualties on the infantry as well. Field guns such as the Ordnance QF 25 pounder were provided with armor-piercing shot for direct engagement of enemy tanks. Anti-tank guns are guns designed to destroy armored vehicles from defensive positions. In order to penetrate vehicle armor they fire smaller caliber shells from longer-barreled guns to achieve higher muzzle velocity than field artillery weapons, many of which are howitzers. The higher velocity, flatter trajectory ballistics provide terminal kinetic energy to penetrate the moving/static target's armor at a given range and contact's angle. 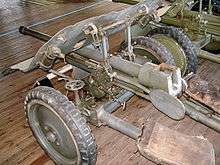 Any field artillery cannon with barrel length 15 to 25 times longer than its caliber was able also to fire anti-tank ammunition, such as the Soviet A-19. Prior to World War II few anti-tank guns had (or needed) calibers larger than 50 mm. Examples of guns in this class include the German 37 mm, US 37 mm (the largest gun able to be towed by the jeep), French 25 mm and 47 mm guns, British QF 2-pounder (40 mm), Italian 47 mm and Soviet 45 mm. All of these light weapons could penetrate the thin armor found on most pre-war and early war tanks. At the start of World War II many of these weapons were still being used operationally, along with a newer generation of light guns that closely resembled their WWI counterparts. After Soviet T-34 and KV tanks were encountered these guns were recognized as ineffective against sloped armor, with the German lightweight 37 mm gun quickly nicknamed the "tank door knocker" (German: Panzeranklopfgerät), for revealing its presence without penetrating the armor. Germany introduced more powerful anti-tank guns, some which had been in the early stages of development prior to the war. By late 1942 the Germans had an excellent 50-mm high-velocity design, while they faced the QF 6-pounder introduced in the North African Campaign by the British Army, and later adopted by the US Army. 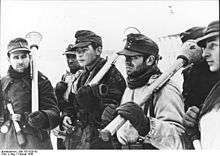 By 1943 Wehrmacht was forced to adopt still larger calibers on the Eastern Front, the 75 mm and the famous 88 mm guns. The Red Army used a variety of 45 mm, 57 mm, and 100 mm guns, as well as deploying general-purpose 76.2 mm and 122-mm guns in the anti-tank role. For the Invasion of Normandy the British produced the 3-inch (76.2 mm) calibre QF 17 pounder, whose design had begun before the 6 pounder entered service, which proved to be a highly effective anti-tank gun and was also used on the tank and the tank destroyer. 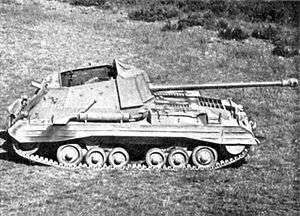 Early German-designed tank destroyers, such as the Marder I, employed existing light French or Czech design tank chassis, installing an AT gun as part of an armored, turret-less superstructure. This method reduced both weight and conversion costs. The Soviet Union later adopted this style of self-propelled anti-tank gun or tank destroyer. This type of tank destroyer had the advantage of a reduced silhouette, allowing the crew to more frequently fire from defilade ambush positions. Such designs were easier and faster to manufacture and offered good crew protection, though the lack of a turret limited the gun's traverse to a few degrees. This meant that if the TD became immobilized due to engine failure or track damage, it could not rotate its gun to counter opposing tanks, making it an easy target. This vulnerability was later exploited by opposing tank forces. Late in the war, it was not unusual to find even the largest and most powerful tank destroyer abandoned on the field after a battle, having been immobilized by a single high-explosive shell to the track or front drive sprocket. Although by 1943 other armies judged the anti-tank rifle to lack combat effectiveness due to their diminished ability to penetrate the thicker armor of new tanks, the anti-tank rifle remained in Soviet use during the conflict for its place in the system of anti-tank defensive tactics. The development of light, man-portable, anti-tank weapons increased during the Second World War. Most were based on the Munroe effect which led to the development of the high-explosive shaped charge. 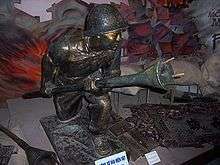 These weapons were called high-explosive anti-tank (HEAT). The destructive effect was reliant entirely on the kinetic energy of the explosion rather than the ballistic speed of the round on the damage inflicted to the armor. The effect was also concentrated and could penetrate more armor for a given amount of explosives. 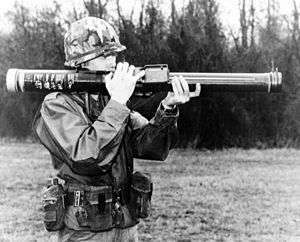 The first HEAT rounds were rifle grenades, but better delivery systems were soon introduced: the British PIAT was propelled by an explosive charge combined with a powerful spring, the US Bazooka and the German Panzerschreck used rockets, and the German Panzerfaust was a small recoilless gun. The HEAT warhead was retroactively used to give more power to smaller calibre weapons such as in the conversion of the otherwise limited German 37 mm PaK guns to fire a large shell (that fitted over the barrel rather than down in it) to a greater range than the Panzerschreck could manage. After the war research on infantry anti-tank weapons continued, with most designers focused on two primary goals: First an anti-tank weapon that could defeat more heavily armored postwar tanks and fighting vehicles, and second a weapon lightweight and portable enough for infantry use. Anti-tank tactics developed rapidly during the war but along different paths in different armies based on the threats they faced and the technologies they were able to produce. Very little development took place in UK because weapons available in 1940 were judged adequate for engaging Italian and German tanks during most of the North African Campaign. Its experience therefore failed to influence US Army's anti-tank doctrine prior to 1944. From 1941 German anti-tank tactics developed rapidly as a result of being surprised by the previously unknown Soviet tank designs, forcing introduction of new technologies and new tactics. The Red Army was also faced with a new challenge in anti-tank warfare after losing most of its tank fleet and a considerable part of its anti-tank capable cannons. Anti-tank defense proper was by 1942 designed in First World War fashion with several prepared trench lines incorporating anti-tank weapons of different capabilities. Depending on terrain and available line-of-sight, the longer-ranged guns could begin to fire on approaching tanks from as far as 2 kilometers, which was also the range at which German Panther and Tiger tank gunners were trained to fire. Anti-tank guns were usually deployed to cover terrain more suitable for tanks, and were protected by minefields laid at about 500 meters to 1 kilometer from their positions by combat engineers. In the Red Army the anti-tank rifle units would be positioned throughout the forward trench line and would engage the lighter tanks and any other vehicles, such as infantry half-tracks in an attempt to separate them from the tanks. The anti-tank guns deployed further back would often hold their fire until enemy tanks were within the most effective range for their ammunition. 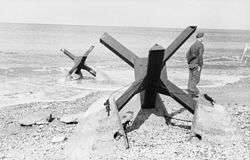 Where there were insufficient anti-tank weapons, engineers would construct anti-tank obstacles such as dragon's teeth or czech hedgehog. Tactic of ambushing enemy armor at grazing shot distances was perfected during world war 2. Some combatants, like the Soviet Red Army, doctrinalized it and used it to engage heavy German armor at optimal distances and angles. 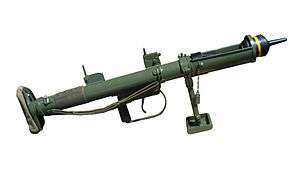 The British Army had abandoned the anti-tank rifle by 1942 and the Wehrmacht by 1943, while the US Army never adopted the weapon, although the USMC used Boys anti-tank rifles in the Pacific Theater. The Red Army did not abandon the anti-tank rifle due to the importance it occupied in its doctrine of anti-tank in-depth defense, first demonstrated during the defense of Moscow and again during the Kursk battles. This became particularly true later in the war when the Red Army assumed an almost constant offensive, and anti-tank in-depth defensive deployments were used for protecting flanks of the operational breakthroughs against German tactical counterattacks. By firing on the lighter armored infantry and support vehicles (e.g. artillery tractors) the anti-tank rifle units helped to separate the supporting infantry (panzergrenadiers) and artillery of the German tanks and so forced the tanks to halt at short distances from the concealed anti-tank guns leaving them exposed to fire from larger, longer ranged anti-tank guns. PTRS-41 semi-automatic anti-tank rifles were also used for sniping since an additional tracer round enabled rapid fire adjustment by the gunner. Although optical sniper scopes were tried with the PTRS-41, the weapons proved too inaccurate at sniping distances (800 m or more), and the recoil too much for effective use of the scopes. Whilst many hand-held infantry anti-tank weapons will not penetrate the front armor of a tank, they may penetrate the less heavily armored top, rear, and sides. Anti-tank weapons can damage the tracks or running gear to inflict a mobility kill. Early WWII tanks had open vision slits which could be fired through to kill the crew. Later tanks' slits had thick glass, as well as sights and periscopes which could still be damaged with powerful small arms such as anti-tank rifles and heavy machine guns, hampering the crew. If all else fails, the hatch could also be forced open and grenades thrown inside, although later tank designs often have hatches designed to be difficult to open from the outside. In some cases in World War II, a tactic of some infantry was to run directly up to a tank, avoiding their main and machine guns, and pour petrol over and into the tank and light it, sometimes blocking the exit, burning the crew alive. During the Iran–Iraq War the Iranian Mohammad Hossein Fahmideh blew himself up under an Iraqi tank with a grenade. According to Sudanese writer Mansour Al-Hadj, Sudanese jihadists were trained to attack enemy tanks by suicide bombing them. The Korean War highlighted the difficulties that can arise with tank forces when vulnerable logistical support is combined with terrain not suitable for tanks. In the early stages of the war, North Korea's well-equipped tank divisions were pushed back to the Yalu River, the border with China, by superior American air power combined with artillery and infantry support. However, when the Chinese entered the war, they managed to reverse the American advances with infantry power alone. Because of the terrain and the need to keep the tanks supplied, American tanks were limited to two main roads. The Chinese merely occupied the land between the roads and harried the American supply lines and troop transports along the road. The Chinese infantry stuck to land that was impassable to tanks, such as rocky prominences and rice paddies, neutralizing the advantage of both American armored divisions and air support. All of the above but the CLGP can be fired from medium (122/152/155-mm) artillery, both tube and rocket. There has also been development of large caliber (81 mm and larger) guided mortar munitions with both internal (e.g., IR or radar) or external (i.e., laser designator) guidance. The development of the wire-guided missile, or Anti-Tank Guided Weapon (ATGW) systems came into use in the late 1950s and 1960s that could defeat any known tank at ranges beyond that of the guns of the accompanying infantry. The United Kingdom, France, and other NATO countries were among the first to develop such weapons (e.g., the Malkara missile by the UK and Australia in 1958). The Soviet Union, and now Russia, put extensive development into these weapons; the first man-portable model to enter service was the AT-3 in 1961. The United States was one of the last, coming up with the BGM-71 TOW in 1970. For a time, it appeared that the tank was a dead end. A small team of infantry with a few missiles in a well-concealed position could take on a number of the largest and most expensive tanks. In the 1973 Yom Kippur War, Soviet first-generation wire-guided missiles employed by the Egyptian forces inflicted heavy casualties on Israeli tank units, causing a major crisis of confidence for tank designers. Active protection systems such as the Russian Arena active protection system are starting to be more common, with similar systems such as the Israeli Iron Fist active protection system. The tank may be on a comeback because of active defense systems, which attack missiles in mid-air. This may allow the tank to be competitive on the battlefield once again. Of the world's major armies, only the Soviet Red Army retained anti-tank guns in any significant quantity, mostly in 100 mm, 115 mm, and 125 mm calibers. The 125 mm anti-tank guns are extremely bulky and massive, and require large tractors to tow them for any significant distance. This is offset by their cheapness and potentially deadly effect, particularly now that they have been upgraded with laser rangefinders and depleted uranium ammunition. The effect of anti-tank warfare is to prevent enemy tanks, and their supporting troops from maneuvering, which is the primary capability of the tanks. In the US Army the degree of effect by an anti-tank weapon on a vehicle is referred to as either "mobility kill", "firepower kill", and "catastrophic kill". In a mobility kill (M-kill), the vehicle loses its ability to move, for example, by breaking a tank track; the target is then immobile, but may retain full use of its weapons and still be able to fight to some extent. A firepower kill (F-kill) is some loss of the vehicle's ability to fire its weapons. M-kills and F-kills may be complete or partial, the latter corresponding to reductions in a target's ability to move or fire. A catastrophic kill (K-kill) removes the tank's ability to fight completely; this may entail complete destruction of the tank or disabling the crew. ↑ Dr. J.R. Crittenden, "RPG-The Devil's Finger", Shotgun News, Nov. 20, 2003, P.30. ↑ Chant, Christoper, How Weapons Work, Marshal Cavendish, Ltd,, Hong Kong, 1980, p.50. ↑ "Leonard Thomas Piper". WW2 People's War (article a2504530). Retrieved 20 July 2006. ↑ Schaedler, Luc (2007). Angry Monk: Reflections on Tibet: Literary, Historical, and Oral Sources for a Documentary Film (PDF) (Thesis Presented to the Faculty of Arts of the University of Zurich For the Degree of Doctor of Philosophy). University of Zurich, Faculty of Arts. p. 518. Archived from the original (PDF) on 10 June 2015. Retrieved 24 April 2014. ↑ Harmsen, Peter (2013). Shanghai 1937: Stalingrad on the Yangtze (illustrated ed.). Casemate. p. 112. ISBN 161200167X. Retrieved 24 April 2014. ↑ "Chinese Tank Forces and Battles before 1949, Chapter One: PLA Tank Forces In Its Infancy". TANKS! e-Magazine (#4). Summer 2001. Archived from the original on 7 August 2014. Retrieved 2 August 2014. ↑ Xin Hui (8 January 2002). "Xinhui Presents: Chinese Tank Forces and Battles before 1949". Newsletter 1-8-2002 Articles. Archived from the original on 8 August 2014. Retrieved 2 August 2014. ↑ Olsen, Lance (2012). Taierzhuang 1938 – Stalingrad 1942. Numistamp. Clear Mind Publishing. ISBN 978-0-9838435-9-7. Retrieved 24 April 2014. ↑ Dr Ong Siew Chey (2011). China Condensed: 5,000 Years of History & Culture (reprint ed.). Marshall Cavendish International Asia Pte Ltd. p. 79. ISBN 9814312991. Retrieved April 24, 2014. ↑ Carter Malkasian (29 May 2014). The Korean War. Osprey Publishing. pp. 22–. ISBN 978-1-4728-0994-0. ↑ T. I. Han (1 May 2011). Lonesome Hero: Memoir of a Korea War POW. AuthorHouse. pp. 69–. ISBN 978-1-4634-1176-3. ↑ Sonia Ryang (16 January 2009). North Korea: Toward a Better Understanding. Lexington Books. pp. 78–. ISBN 978-0-7391-3207-4. ↑ "Reformist Writer Mansour Al-Hadj: In My Youth, I Was Taught to Love Death". MEMRI. www.aafaqmagazine.com. November 19, 2009. ↑ Helicopters at War, Blitz Editions, p. 63, ISBN 1-85605-345-8. ↑ Verier, Mike. Bell AH-1 Cobra. Osprey Publishing, 1990. ISBN 0-85045-934-6. ↑ "Telegraph article". The Daily Telegraph.